Take a moment to remember and honor 88 year-old veteran Delbert Belton who was beaten to death in Spokane, Washington by a couple of teens. He was laid to rest this afternoon, 8/29/2013 in Spokane, Washington, with Full Military Honors. I am dedicating the website this month to my husband and my daughter. Both celebrate their birthdays this month and both on the same day. Although my husband is not a veteran, his patience and support for this project has been beyond my expectations. 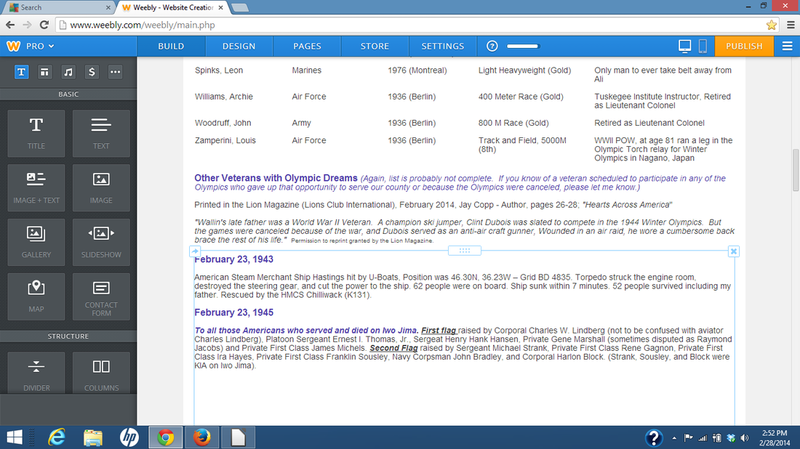 Also to my cousin, W. Scott M., also born in September and a Vietnam Army Veteran - dearly loved. September 3, 2013 - Please remember Errol Williams, US Navy Veteran from Rockingham, North Carolina who was shot to death on September 1, 2013 by men who tried to kidnap him and then stole his vehicle. FOR THOSE WORLD WAR II VETERANS IN WHEELCHAIRSWHO HAD TRAVELED SO FAR TO SEE THE MEMORIAL. these very bleak economic times. This is a very special month as people honor our Veterans on Veterans Day, November 11. Also, the website is dedicated this month to my son, James A.D. who was born in November and is an Air Force Veteran. Thank you for your service son. With humble gratitude for those who served, fought, died, and lived during Pearl Harbor. May your memories be sustained in our souls forever. This is a special month for Dedications. 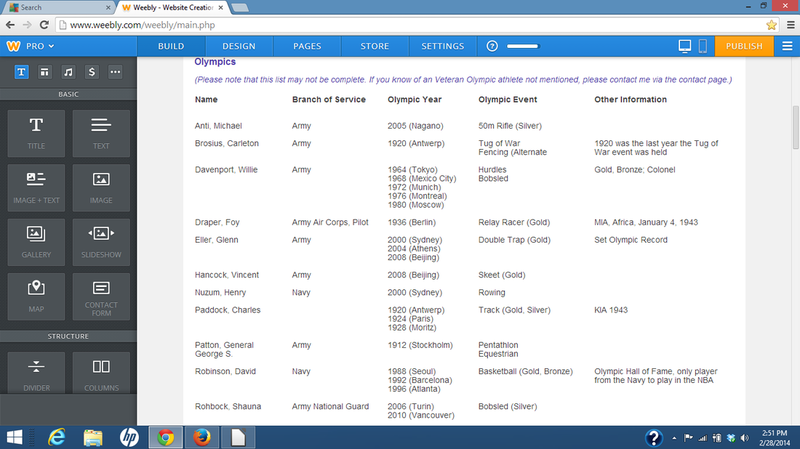 I wanted to honor Veterans who were athletes and participated in either the Superbowl or Olympics. February 23 is the anniversary of the raising of the American Flag over Iwo Jima. It is also the anniversary of the sinking of my dad's ship. Rocky Bleir – Following his rookie season with the Pittsburgh Steelers in 1968, Rocky was drafted by the Army. In August 1969, we was severely wounded by gunshots and an exploding grenade. He received the Purple Heart and the Bronze Star. Doctors later informed him that he would never play football again. He struggled to recover but finally managed to return to the Pittsburgh Steelers roster in 1974. He played in four Steeler Super Bowl victories and is noted for catching the touchdown pass from Terry Bradshaw that gave Pittsburgh the Super Bowl XIII win. He became the Steelers fourth all-time leading rusher. He is now retired. Dedicated to those 24 Veterans who will finally receive the Medal of Honor not previously awarded due to discrimination. And To Joe Bell, World War II Veteran, San Jose, California (Age 95) who wore his uniform to cheer on local runners. Dedicated to All Those who suffer as a result of PTSD. As we begin this Memorial Day weekend, consider cleaning and sprucing up of your local war Memorials. While it is ever so important that we remember all these men and women, we have to also take care of the Memorials so that they endure time and the elements. I have been determined NOT to participate in any support of any political issues on this site and to maintain that dedication to all of the Memorials and Monuments. However, over the last few weeks I have been overwhelmingly disturbed by the disheartening news of how the VA system has abandoned our soldiers and their families. The seriousness of this issue is one for which we can not put our heads in the sand and hide. We can NOT allow our Veterans to suffer. Unfortunately, delays like the ones described in the news that caused the deaths of men and women waiting to be seen, have been going on for a very long time. In the early 1970s I helped my dad type letters to the VA and other members of Congress in an effort to receive assistance for issues from which he suffered. All to no avail. My dad was proud of his service to his country but after so many disturbing incidents with the VA, he specifically requested that no American Flag be placed on his coffin at his death. Instead, the flag was placed in my mothers arms. The flag was given to me at her death. Even in his death, my Dad sent a strong message of protest to the Veterans Administration. Apparently they did not get that message. Since those years, I have talked to many Veterans and the common thread expressed by so many of them is that "if you don't want to die, don't go to the VA hospital." That is sad but apparently true. The Veterans Administration needs to be overhauled immediately. Contact your Congressman/Congresswoman to express your opinion. Tell them to get changes started - NOW. Even as I type this, there is breaking news of a VA hospital in Wyoming that will soon come under close scrutiny. How horribly sad. This is dedicated to those who died waiting. to all of the wonderful women who have served and/or continue to serve our country. Your sacrifice, especially in having to leave your children behind to fight for our freedom, is appreciated. To those just receiving the Congressional Medal of Honor, September 15, 2014.